June | 2009 | Where is Yvette? If you ever want to start a running for the prettiest city in the world, there is no doubt that Cape Town is up near the top of that list. It’s rather Auckland-like actually, from the waterfront area to all the mountains around. It goes without saying that it’s not your average city where you can get a range of mountains like this just a few minutes drive from downtown. 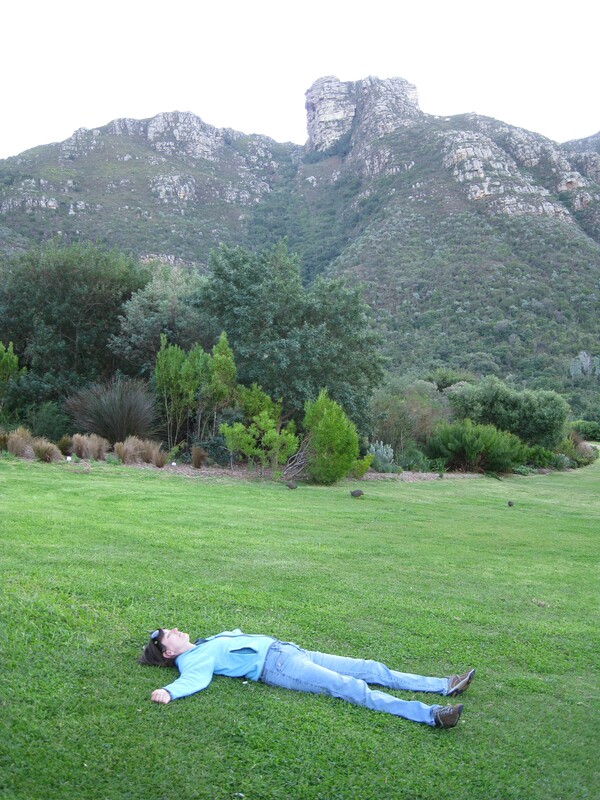 But to top it off, being British they also figured out that it would be cool to place the Cape Town botanical garden at the foot of Table Mountain, and since my mom is obsessed with flowers (I was going to write “loves” but that doesn’t cover her true feelings) we headed over. Clearly, some of us are more interested in resting rather than checking out plants- guess our obsessions are not particularly genetic? To be fair, I did like quite a few of the flora in the garden, such as the yellow bird of paradise plant named after Nelson Mandela (as I’ve only seen orange ones before, and yellow looks quite nice!). 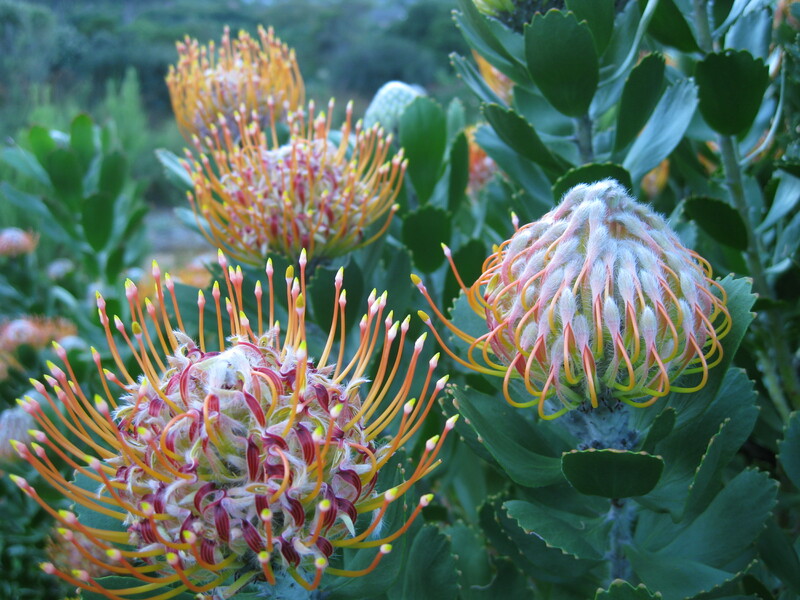 The flowers above, called protea, are my favorites though. Don’t they look like some sort of alien plant? They feel fuzzy on the inside too. 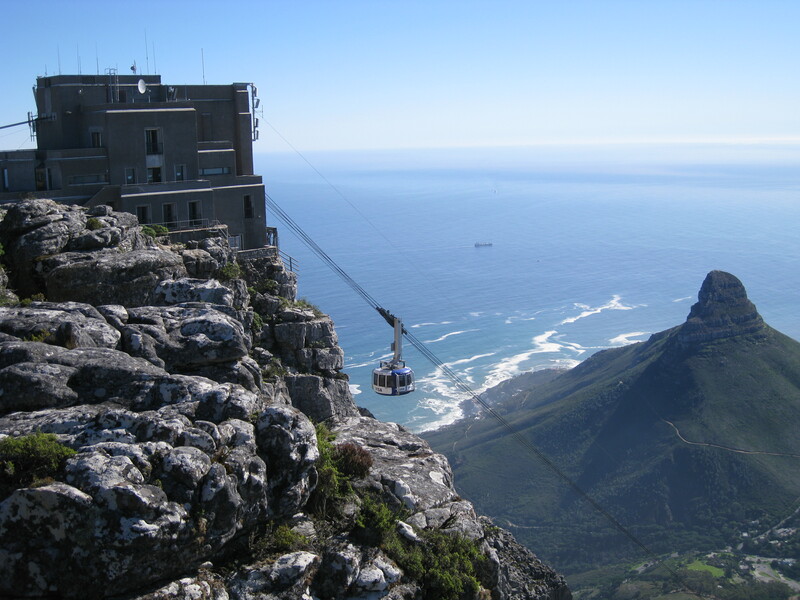 It should be noted that Cape Town is famous in the botanical world for being its own floral region due to the surrounding desert. What this means is you have several thousand plants that occur here and nowhere else- by comparison all of North America counts as the same region, just to give you an idea of the special plants that crop up here! Rather dramatic, isn’t it? Though it is a common misconception that this is where the Indian and Atlantic Oceans meet- that’s a few km over- but this is where the warm current mixes with the cold current and what really matters in the natural world (compared to what our human naming system dictates). 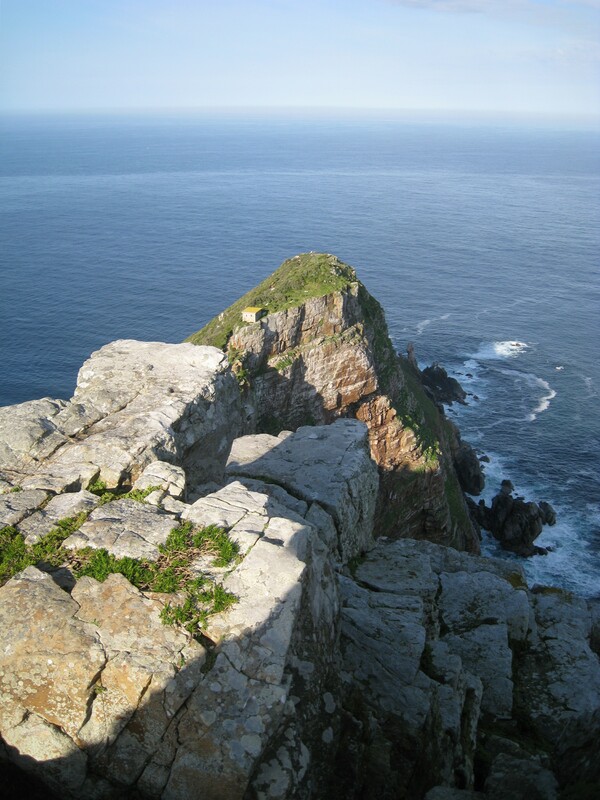 It’s also a really trecherous stretch of coast- for the past 400 years it is estimated that 600 ships have wrecked at or around Cape Point! 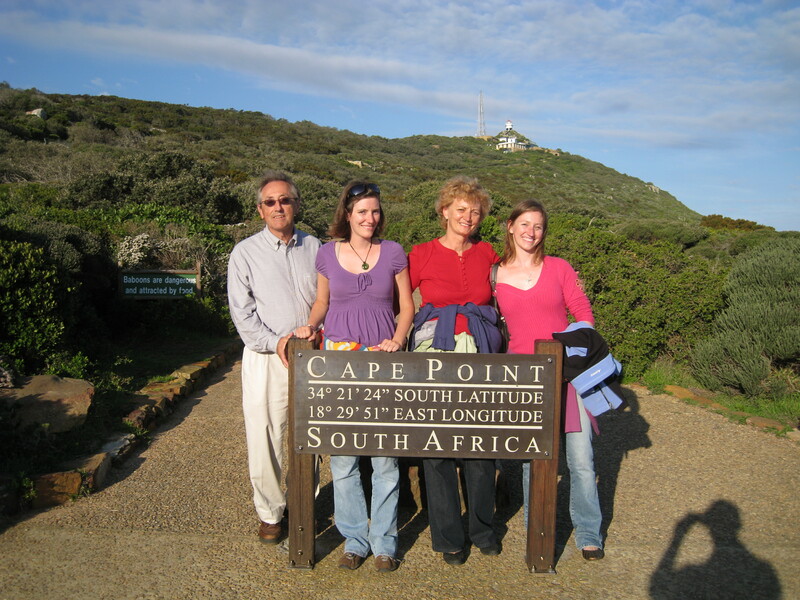 And last but not least, the scenery is pretty but no trip to Cape Point would be complete without visiting the penguin colony. 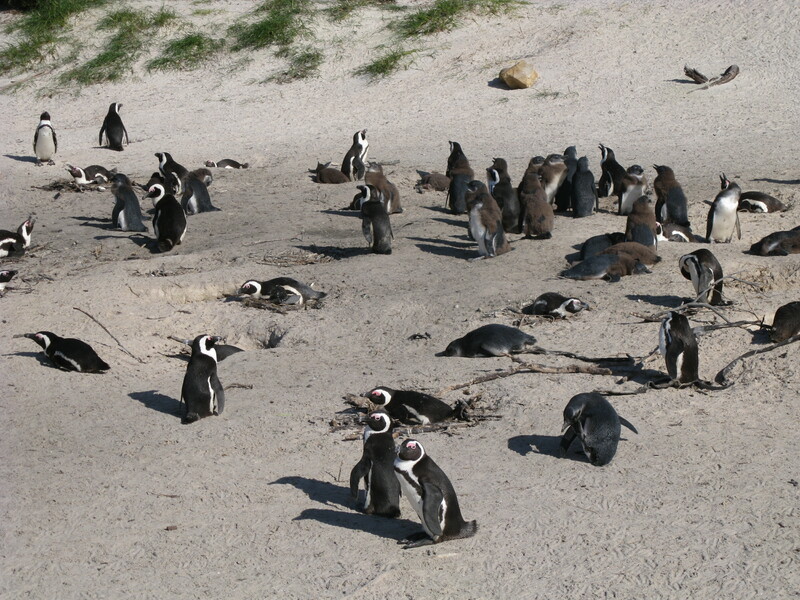 These guys are called “African penguins” officially but used to be called “jackass penguins” due to the noise they make- the claim is other penguins make the braying noise and that’s why they needed to change the name, but I suspect otherwise. Either way, let it be known that it is impossible to encounter a non-cute penguin. Something about how they walk on two legs and are so immaculately dressed in tuxedos will get to you every time. 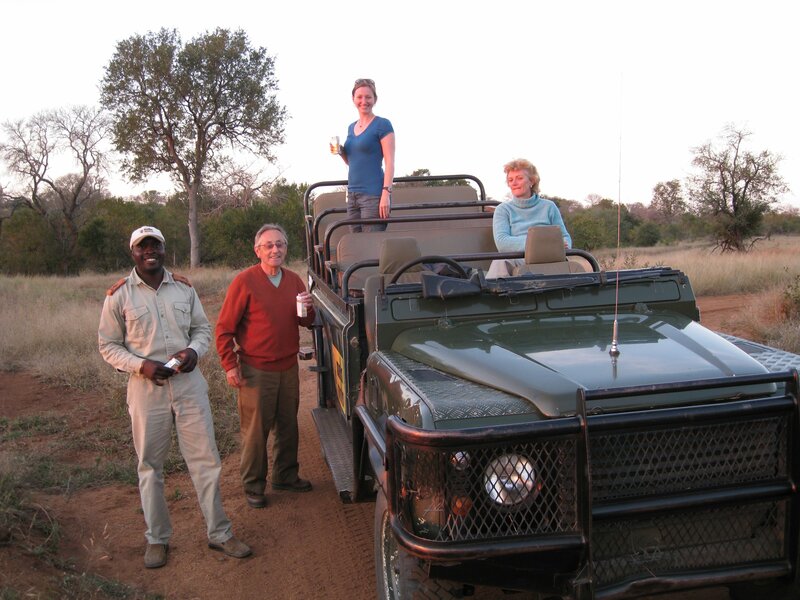 The 4×4 truck we drove around in and Lucky, our guide, at Mala Mala Game Reserve adjacent to Kruger National Park (there are no fences between the areas so the animals can roam as they please). Going around in a 4×4 is awesome by the way because of the off-roading you can do, on the grounds that a herd of wild buffalo do so much worse damage compared to a mere Land Rover. Small tree in the way? Smash. Bushes? Gotta be kidding me, those suckers are gone! Mind you might be in a Land Rover but safari can still be dangerous- the most dangerous is an elephant because they’re bigger than a car, and can flip them over if provoked. We learned this a little too well during our first elephant sighting (not this guy, this was a nice elephant) where there was a mother, a baby, and the equivalent of a teenage boy in a wooded area. The teenage boy was, in the fashion of teenage boys everywhere, with excess energy and burning it off by chasing impala and baboon around. Then there was a bit of ominous rustling in the bushes… and a huge gray thing started streaking towards us. Lucky, being experienced in such matters like a charging elephant, knew enough to turn the Land Rover in the direction of a quick getaway and we sped off, the elephant receding behind us looking like that T-Rex scene in Jurassic Park. It should be noted that during the elephant charge (which we were later informed was a “play charge” and hence not as serious) I was laughing my head off, to the bewilderment of my parents later. I suppose I should mention that I wasn’t worried at this moment, frankly because there was absolutely nothing I could have done had the situation become serious so I may as well have fun with it right? 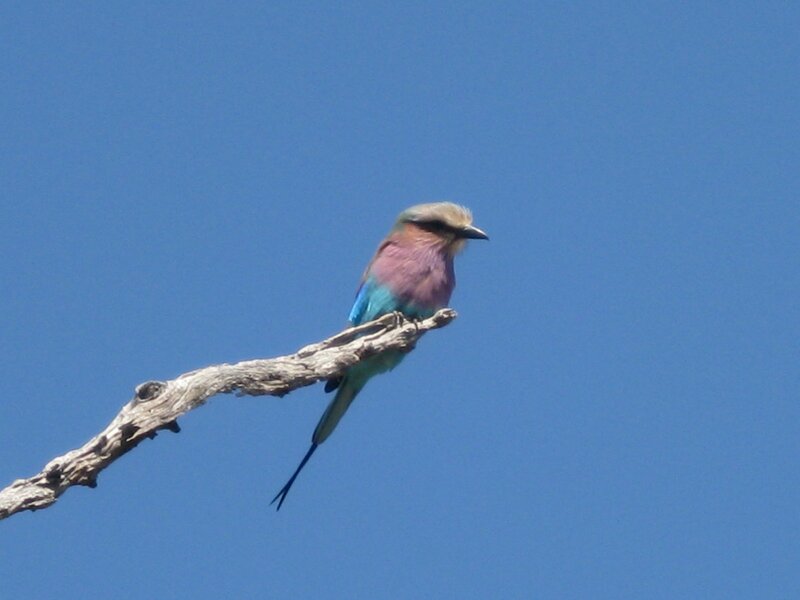 My sister being a studier of birds (“not a birder!” I am informed) kept a good eye out for interesting ones, and this one is definitely the prettiest bird of the veld- a lilac-breasted roller. My favorite though was called a gray lorrie because of the “nyahhh” sound that is straight out of my “I’m being too lazy for words” vocabulary and always made me smile. Of course, the trick about safaris is most of the animals sleep during the day and only come out at night, meaning you drive around with a flashlight trying to catch animals by the reflection of their eyes (you only keep light on non-predators like impala for a brief amount of time though because it gives the predators an unfair advantage). 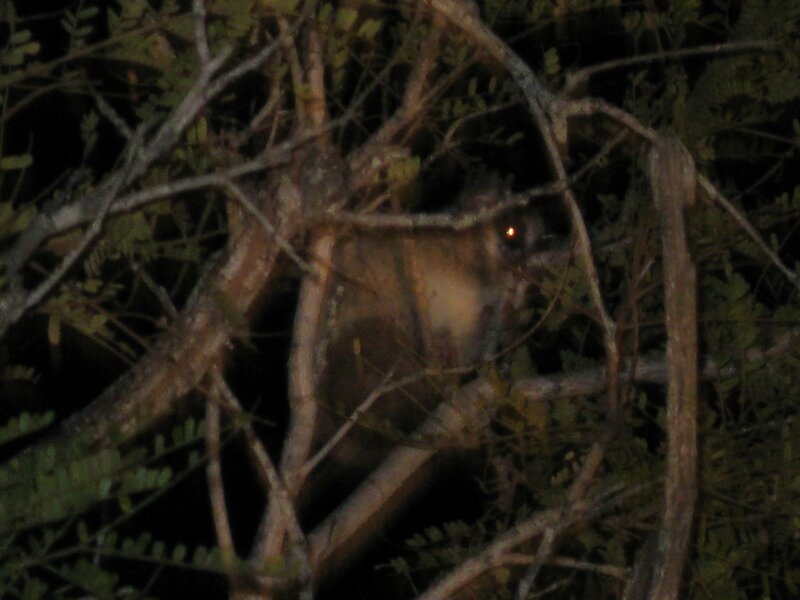 This here is a lesser bushbaby hiding in a tree, which is a small primate. 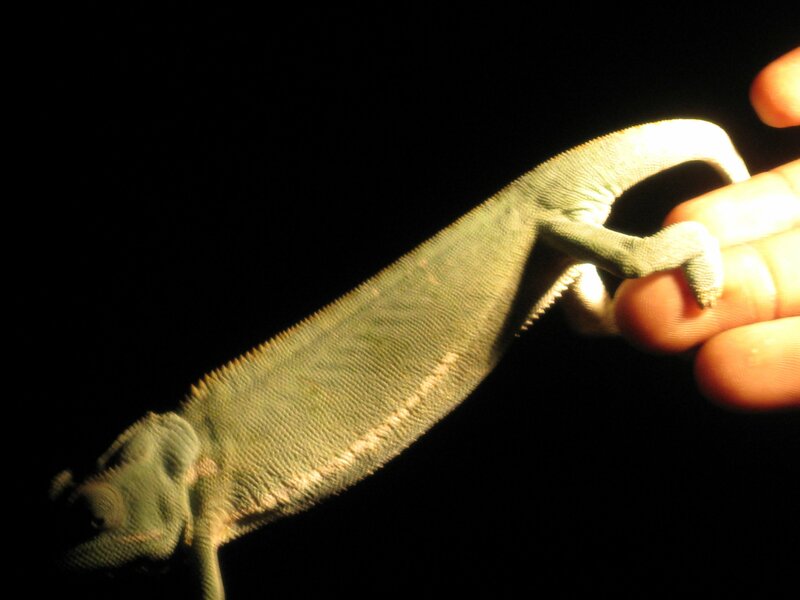 Another cool night find- a chameleon! We picked one up to play with a bit and he even started changing color to match Linda’s dark blue sweater when she held him, like any proper chameleon should. Quite awesome. I have it all on video that I will upload once I’m not at the mercy of slow African internet, but here’s a synopsis of what happened. 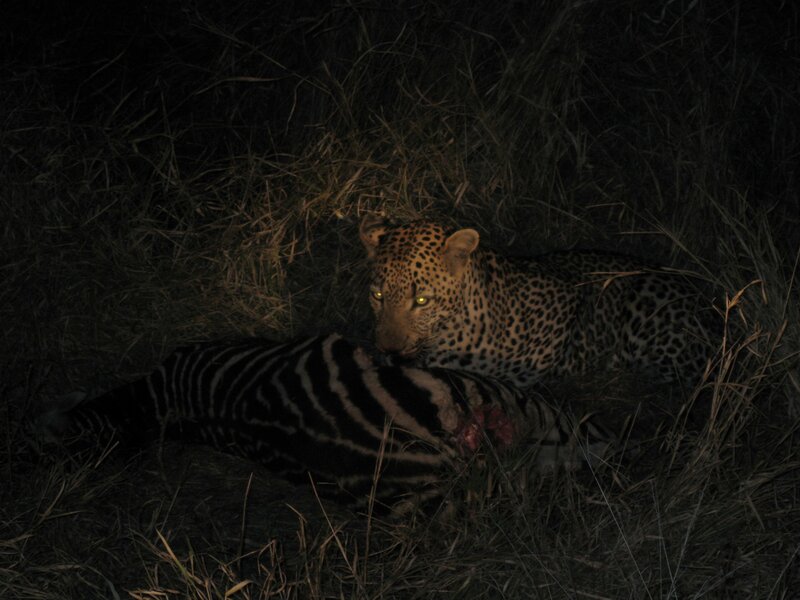 They hyena showed up and snarles were exchanged but they proceeded to feed on the carcass together for an uneasy minute, until the hyena got greedy and started heading for the leopard’s side. The leopard retaliated with a well-aimed paw swipe to the right side of the hyena’s face, just below the eye, and after a few seconds the hyena slunk off, undoubtedly injured. I’m still not over seeing that with my own eyes, frankly! Safari is awesome. Good thing I have some more in my future or I’d be a little upset right now. 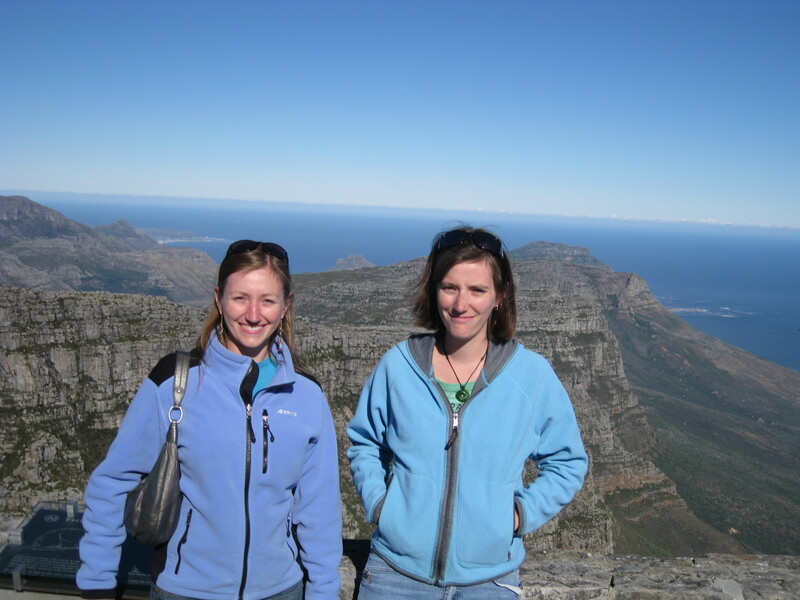 My sister and I just took our first malaria pills- the non crazy dream inducing kind, sorry to disappoint- in anticipation of our overland safari starting tomorrow morning. 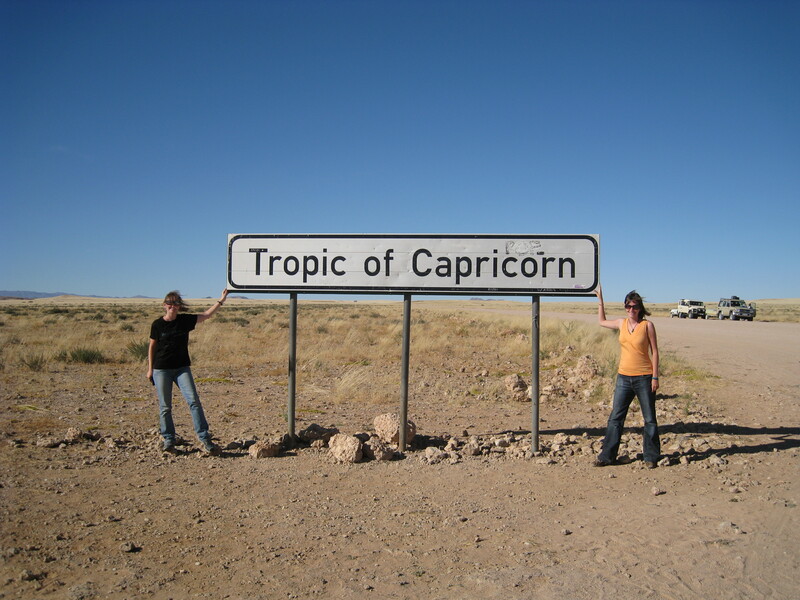 We’re in Cape Town right now and will spend the next three weeks traveling through Namibia and Botswana to Victoria Falls, and I don’t have much faith in finding Internet connections in the bush. On the bright side though, at this rate you will probably get to keep reading about Africa even after I’m gone! To keep you amused until our return to civilization, I finally updated the “By the Numbers” page for interested parties, and I invite you to tell me whether a round the world trip ends when you enter the country you left from or when you go back to the exact point you started. I’m returning to the States around August 1, see, but will be heading to New Hampshire for a few days before going to Pittsburgh to see if my stuff is still in my parent’s basement. And I haven’t completely made up my mind on this yet. Of all the places I have gone so far on my trip, Africa is the one I wanted to see the most. Which is why it’s last, actually- I might be sad to go back soon, but until then I’m in AFRICA! 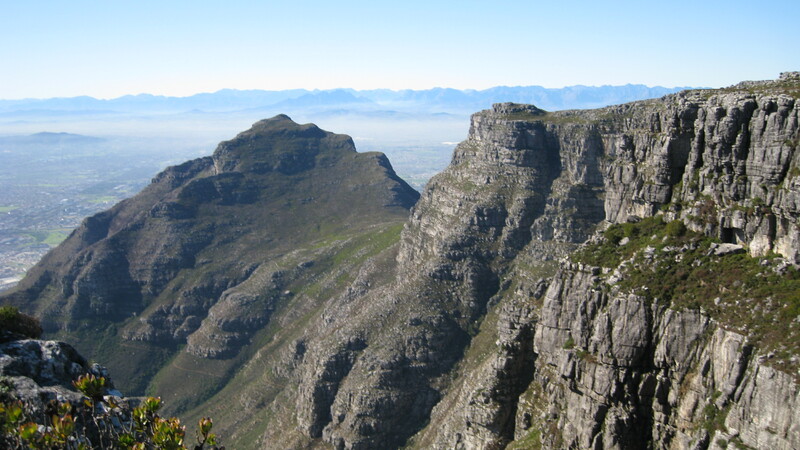 (South Africa actually, for those keeping track.) 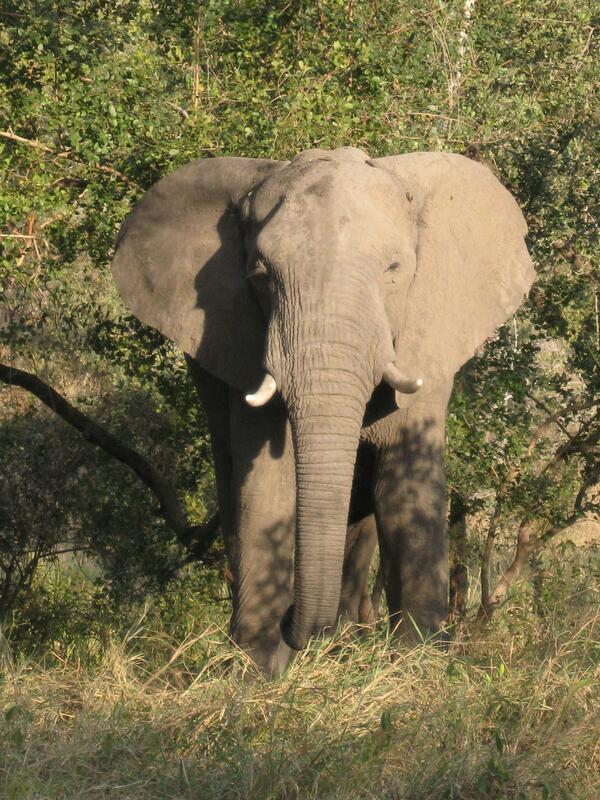 More to follow, but until then have fun with some of my many, many safari pictures just outside Kruger National Park. Because we all love furry animals that can kill us, right? Cheers. – First of all, I got to see Greece with my family who I have not seen in several months. This is good. The fact that we all went on to Africa afterwards was even better. 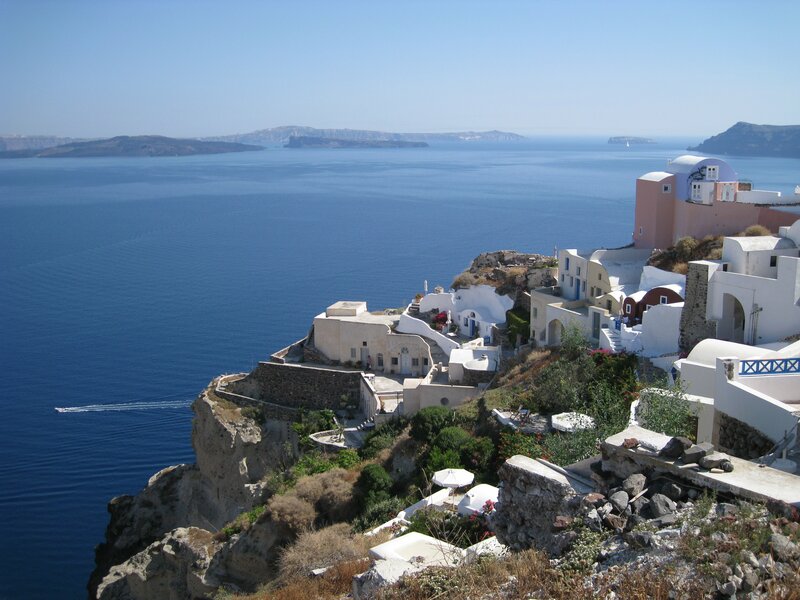 – I liked every place we (briefly) stopped at in Greece, but my favorites have got to be Delos, Mykonos, and Santorini. And I sincerely think Athens has a bad reputation as I thought it was a perfectly fine city for a few days to see the major sites. – Oh, and the food is exemplary here. 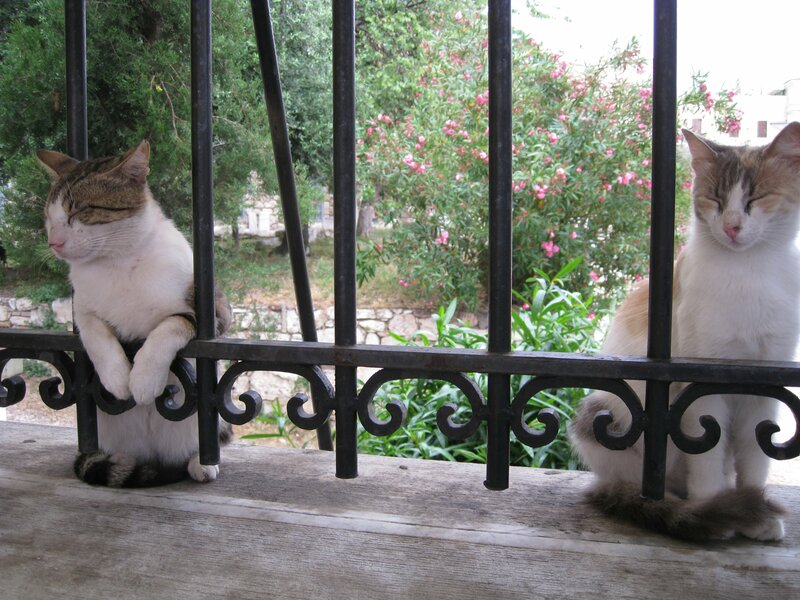 Even if you need to hold regular negotiations with the cats in order to have your share. – I’m just gonna come out with it and say I’m not a cruise person. I mean sure, if I only had a week of vacation I would probably warm up to the idea but can’t say I do partway into a trip around the world where I’m used to moving at my own pace and my way of things. So I got a little annoyed at this aspect at times. – It should also be noted that Greece at this time of year is hot- about 35C during the day is pretty standard, meaning walking around routinely involves elaborate street geometry to move from one shady spot to another. What it must be like in July and August around here I dread to think. Before you ask, Peloponnese is that peninsula of Greece that sticks down into the Mediterranean. Which I was kind of excited to hear about as I’d always wondered where it was. This is the lovely town of Monemvasia, which is a lovely old mideval fortified town and where the cruise stopped for a morning (I confess by this point I had no idea what the names of any of these places were so I needed to look it up just now). They sure picked a lovely spot! The entire place is surrounded by city walls and has old stone arches that you pray “please Poseidon, no earthquakes now ok?” when you pass under as it looks doubtful they’d survive any shaking. The other neat thing about this place is how the roads are so narrow that cars and trucks can’t come in. What does this mean? Well if you want to build within the city you need to use horses and mules to bring the stones and cement in. I’d never seen such a thing happen anywhere in Europe, and it was certainly entertaining to see. The view from Agamemnon’s palace- they sure picked a lovely spot didn’t they? There isn’t much left of the palace, just some stone foundations, so the Lion’s Gate is the most impressive spot. They do have a great museum though. And with that, my story of Greece is done, as the next day we were back in the Athens airport waiting for a plane. But not to worry as the story is about to get really interesting- time for the continent switch to Africa!